Web content should be without spelling and grammatical errors in order for websites and blogs to gain traffic. But this is not always the case because many of us are still able to spot errors from time to time whether on other people’s work or on our own work. It is for this reason that proofreaders and editors exist to help ensure that any written communication conveys its message clearly. If you’re running a website or blog and would like to get tips on how to ensure a free-flowing content without errors, the Proofreading and Editing Services blog provides very useful information. 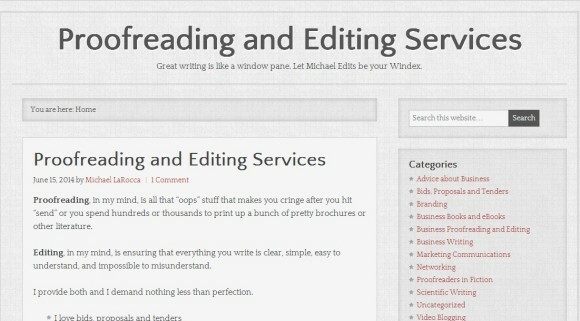 Authored by Michael LaRocca, the site has tips on how to avoid grammar, punctuation and spelling errors and recommends other resources including business books and ebooks focusing on proofreading and editing. LaRocca also presents his services which he started back in 1999 and the clients he’s worked with on the home page.